Q.11 How to prevent back streaming of diffusion pump oil? System is “Roughed out” before Diffusion Pump is put in line. 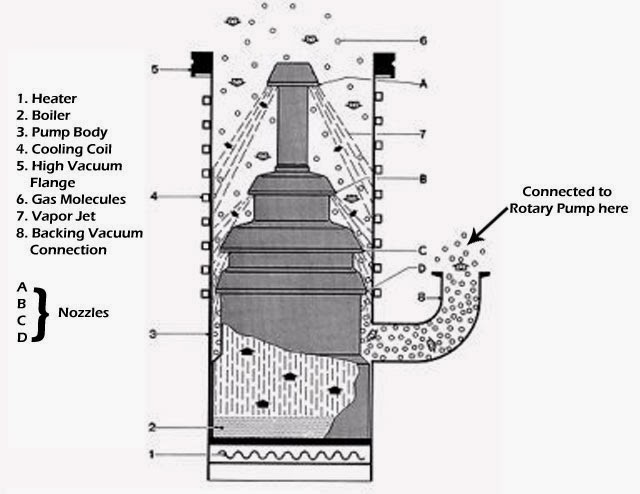 Rotary vacuum pump is maintaining a vacuum of at least 10-2 Torr. If process is causing release of a large amount of gas, then sometimes it may be required to slow down the process. Cooling water output volume and temperature must be checked. If this is not as per the manufacturer’s recommended values then descaling and increasing cooling water circulation is required. If problem of back streaming is frequent then increasing the capacity of backing pump is required to solve it. Diffusion pump must have a cryotrap or at least baffles on top to trap gasses trying to flow out of pump into chamber. All the valves should be checked from time to time. 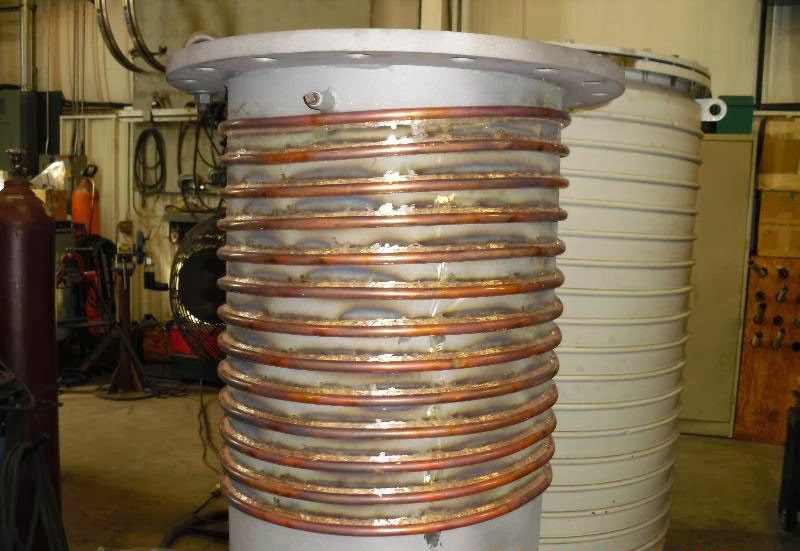 Strange as it may sound, very low fore pressure can also cause back streaming. Q.12 Why is diffusion pump water cooled? Ans. A diffusion pump has no moving parts and therefore depends on diffusion pump oil for creation of vacuum by action of gas diffusion. For diffusion to occur the diffusion pump oil is heated and vaporized using heaters. It is then released through jets at high speed and in this way it traps air by diffusion process. Then it is cooled at walls of diffusion pump. This liquefies the oil vapors and these vapors again turn to liquid state. This completes the cycle and the process repeats continuously. Q.13 I have a Chinese diffusion pump (Not Varian) do I need to use some different kind of diffusion pump oil? Ans. Diffusion pumps as well as Diffusion pump oils are made as per a standard engineering practice of interchangeability. So a good Diffusion pump oil will be suitable for any Diffusion pump made anywhere in the world. Just like same petrol works for cars made by Honda, Suzuki, Audi, Toyota or any other brand. Q.14 What is the difference between Vapor Jet Booster Pump (Ejector Pump) and Diffusion Pump? 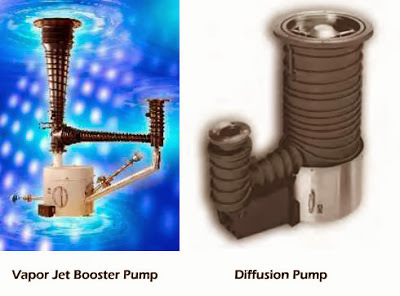 The jet design of diffusion pump and vapor jet booster pump are different. In diffusion pump oil vapors are compressed to a higher compression ratio compared to ejector pump. Because of higher compression ratio diffusion pump is capable of producing vacuum up to 1×10-10 Torr. Where as an ejector pump cannot produce vacuum above 1×10-5 Torr. Vapor jet booster pump creates vacuum in a shorter time than diffusion pump. In an ejector pump the working fluid i.e. vapors jet booster pump oil has lower boiling temperature compared to diffusion pump oil used in diffusion pump. Q.15 When Should I check the diffusion pump oil level? In hot condition or cold condition? Ans. Level of diffusion pump oil should always be checked when pump is cold. In hot condition some oil will be in vapor state so correct level will not be indicated. Q.16 While changing diffusion pump oil should we wait till pump cools down or is this not required? Ans. You should always wait for diffusion pump oil to cool down to room temperature before taking it out of diffusion pump. Diffusion pump oil when heated is at a temperature above 200oC. Trying to take out oil at this temperature can be very dangerous. 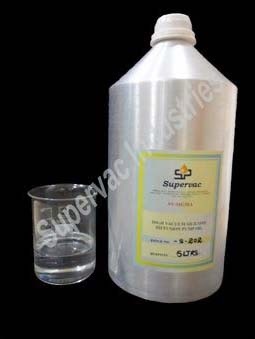 Q.17 What is shelf life of silicone diffusion pump oil? Ans. If stored properly, shelf life of Silicone diffusion pump oil is 2 years. Q.18 Which oil is more economical to use hydrocarbon DP oil or silicone diffusion pump oil? Ans. Under normal circumstances silicone diffusion pump oil works out cheaper because of its long life and no requirement of maintenance. However if plant is very old or process involves emission of corrosive gasses, then hydrocarbon oil may work out cheaper. To know more about this please click here. Q.19 Why is it important to check level of diffusion pump oil regularly? Ans. In case level of diffusion pump oil reduces then thermal equilibrium in diffusion pump is disturbed. This causes Diffusion Pump Oil to overheat, which results in oil loss, loss of vacuum and damage to diffusion pump in extreme cases. 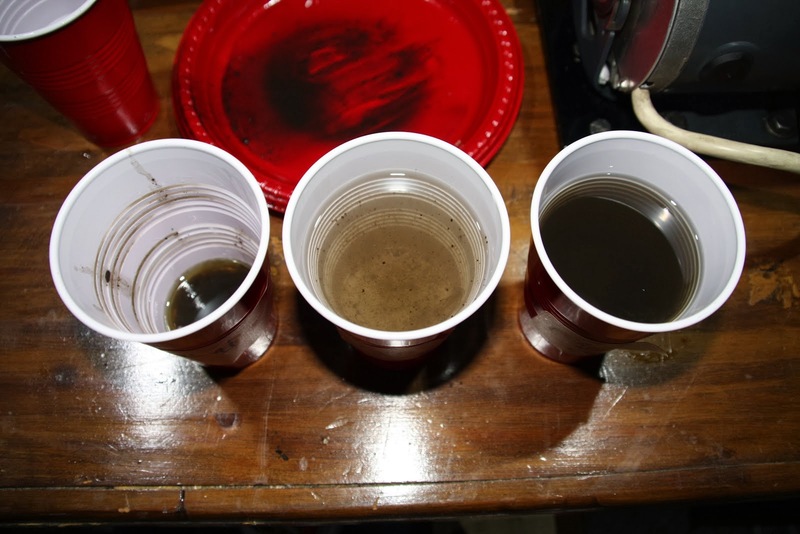 It is therefore important to check the level of diffusion pump oil regularly and top it up if required. Q.20 Can I reuse diffusion pump oil? Ans. No, diffusion pump oil cannot be reused. This is because while creating vacuum diffusion pump oil is subjected to very high temperature and extreme vacuum. 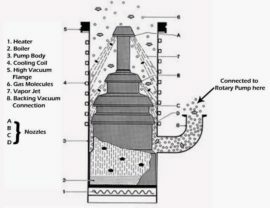 This destroys the molecular structure of oil which cannot be corrected by filtration or distillation. About this read more here.